On Friday the 28th of September, commencing at 10am, sixth formers and staff worked collectively to transform studio one into a coffee shop with a warm, bubbly atmosphere; perfect for outsider visitors to enjoy a cup of coffee and a slice of cake all while raising money for a good cause! Macmillan annually supports these coffee mornings in order to raise money for cancer. 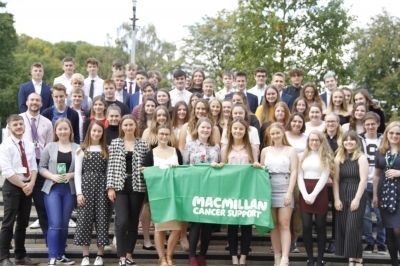 It is a charity which focuses on the social, emotional and practical impact cancer can have, and campaigns for better cancer care - which makes it a charity very close to the heart for many who have been affected by the evil disease. This makes the £620.45 raised by the staff, sixth formers and visitors from the community an incredible success - alongside the £1358.71 raised by the rest of the school on the same day, during ‘Wear Red for Zac’, for a young local boy who unfortunately requires life-saving treatment. The coffee morning was quoted as being ‘lovely and organised’ as well as ‘very nice’ from visitors, ranging from Ironbridge to Broseley and beyond, who were clearly impressed by the work of the sixth form. Of course, it is worthy to note that we even had live music; courtesy of Aimee Sellars and Tabitha Walters, supported by Max Reynolds on the keyboard. Even the staff were impressed! Miss Comerford had this to say: “It is really inspiring to see how the sixth form have come together to produce this very well organised and brilliant event”. Safe to say, the charity work proved beneficial for all, and was easy as pie!